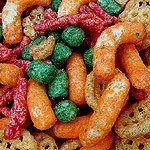 Junk Food of the Gods, Part 3! | Dinosaur Dracula! 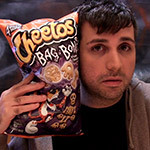 I’m back with the third edition of Junk Food of the Gods, the series in which I raid supermarkets for neon slop that likely won’t be around for very long. Of course, when I put it that way, I’m not sure why I do this. 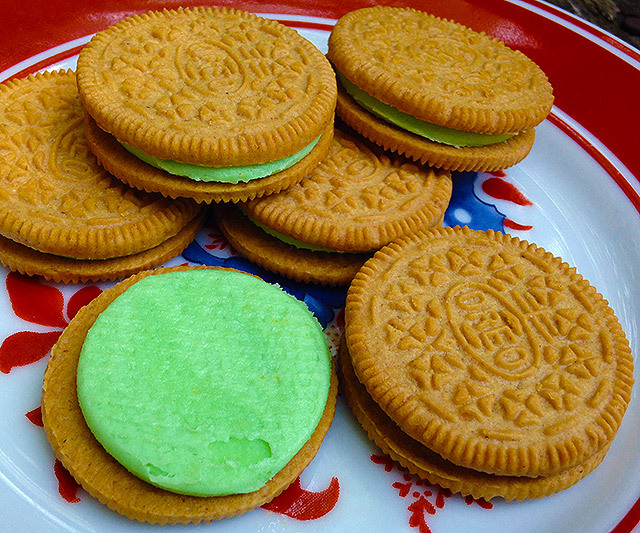 Key Lime Pie Oreo Cookies! 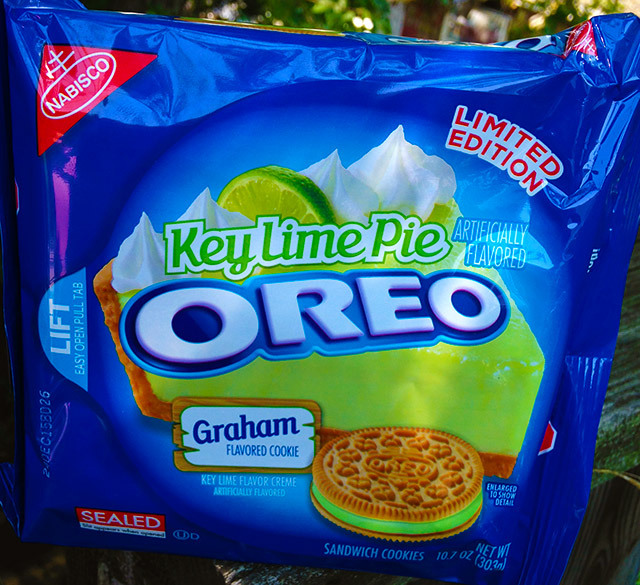 With still another month to go before people trade their swimsuits for funeral attire, Nabisco’s tossed us yet another summer-specific Oreo flavor: Key Lime Pie. I’m not sure that there’s ever been an Oreo with such a pungent odor before. These cookies reek. Depending on your point of view, they either smell exactly like key lime pie or exactly like dollar store tile cleaner. Fortunately, the flavor is more subdued. I’d hesitate to call it “subtle” because my first thought upon biting one was “LIME” in all caps, but still, compared to the smell, they’re practically dull. I honestly don’t know what a key lime pie is supposed to taste like, but for my money, this is lime green Jell-O as Oreo creme filling. Not bad, but not one of my favorites. 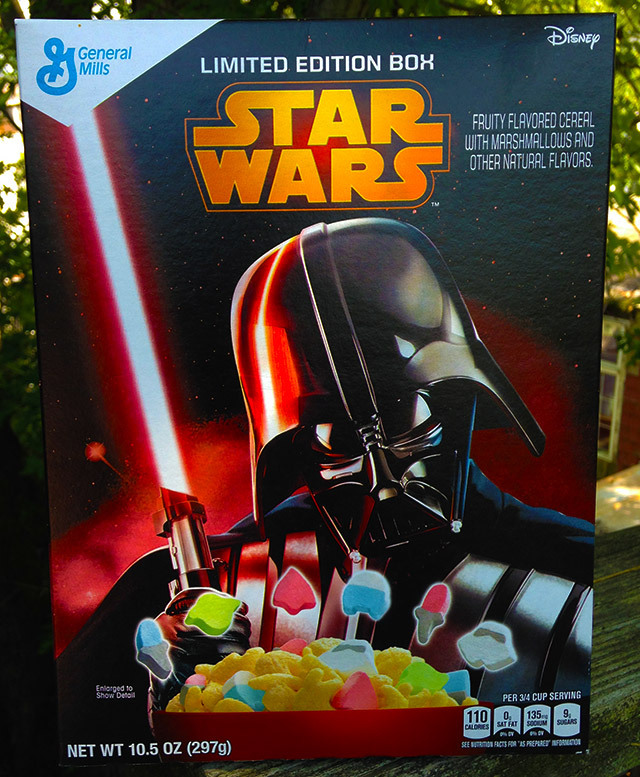 Strange as it sounds, I wasn’t all that excited about the new Star Wars cereal, I guess because it hasn’t been that long since the last version was in stores. I’m happy to report that my indifference was undeserved: This stuff is great! There’s a Yoda box available, too. I chose Darth Vader’s because his was the only box in the whole cereal aisle that made me feel more powerful by association. 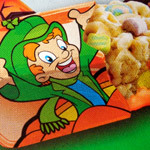 If we could agree that limited edition tie-in cereals are judged chiefly on box art, this one gets an A+. It looks like the cover of an Expanded Universe novel written by someone who really wanted you to believe that his book was viciously adult. They never are; it’s Star Wars. 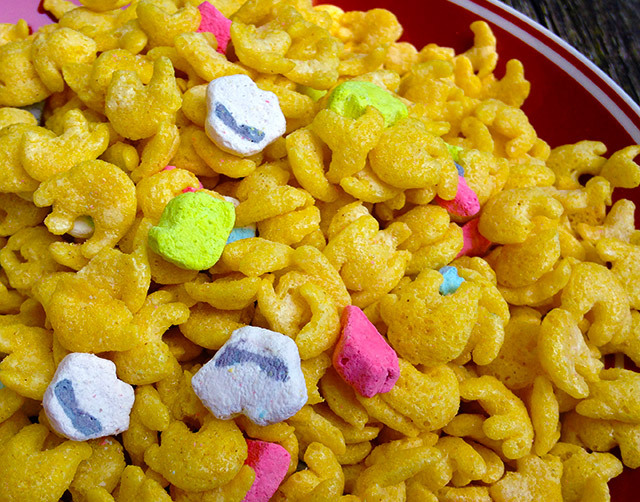 Best of all, the cereal itself is inspired. 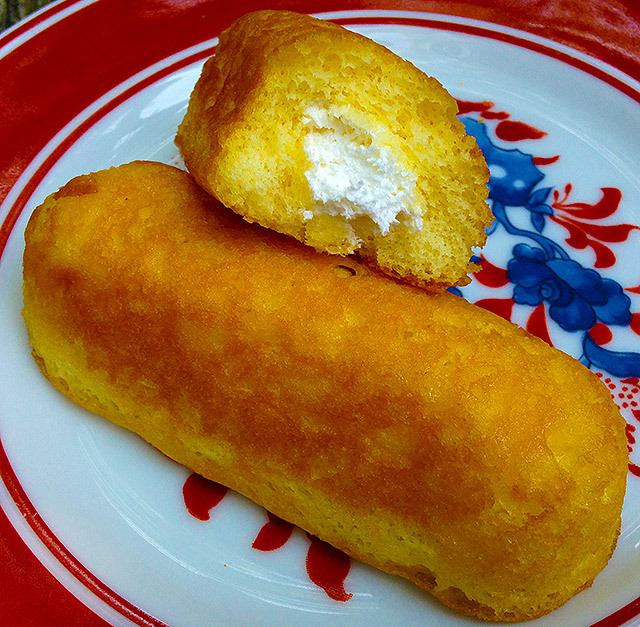 For once, the marshmallows — each shaped like some Star Wars artifact — aren’t the most interesting bits. 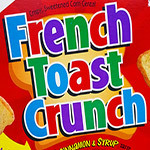 No, that award goes to the “regular” cereal pieces, which in shape and color draw a fine line between “chicken feet” and “Simpsons hands.” The cereal looks alien, and that is absolutely appropriate for this brand. 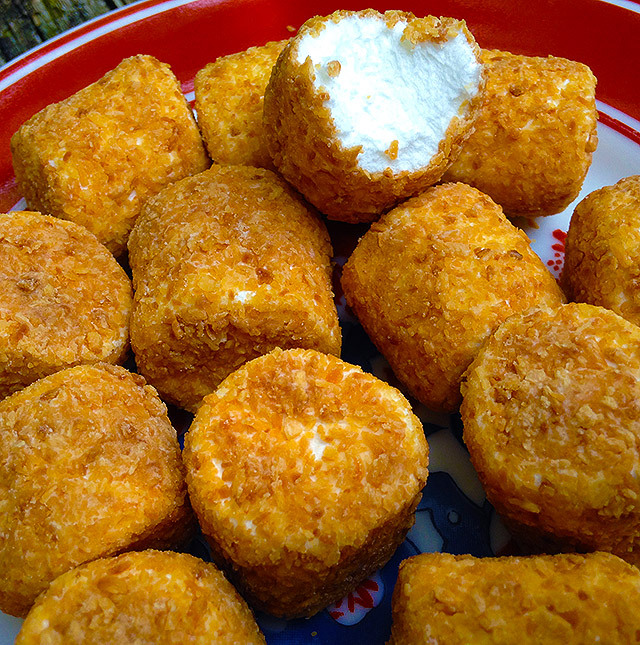 From Kraft, these Jet-Puffed Toasted Coconut Mallow Bites are a mouthful, both in title and actuality. 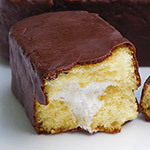 I suppose to make the marshmallows more adhesive, their consistency is closer to Fluff than Kraft’s norm. You don’t bite them as much as merge with them. And God, I’m not wild about coconut, but those toasted flakes are so good. These marshmallows will inspire you to make a cocktail out of jelly beans and Jones soda, just so you have an excuse to skewer them as garnish. 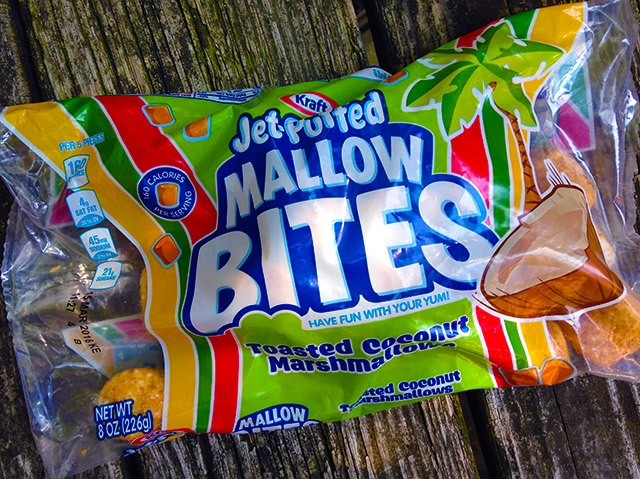 Maybe I’m just buying too much into the palm tree art on the package, but if regular marshmallows are always a party, these marshmallows are always a luau. 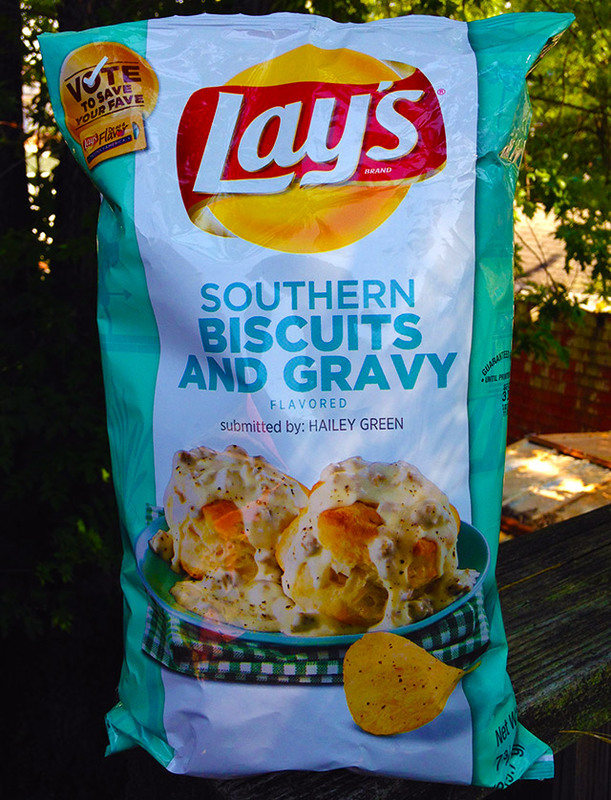 Lay’s Southern Biscuits and Gravy Chips! 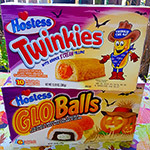 When I first saw a photo of these — paired with other new flavors that are even weirder — I thought I was looking at a Photoshop job. Nope, they’re real! All things being equal, “biscuits and gravy” doesn’t sound like a bad idea for a potato chip flavor. At least, that was my thought until realizing that they meant gross white gravy, shown in such a quantity on the package that it’s as much a tribute to The Stuff as a plea for you to roll your potato chip dice. Verdict? NOT TOO SHABBY. I mean it! I know I wasn’t building to a positive review, but these chips… man… they’re what would happen if barbecue chips and sour cream and onion chips had a baby that left each of its parents’ shittiest aspects in the womb. 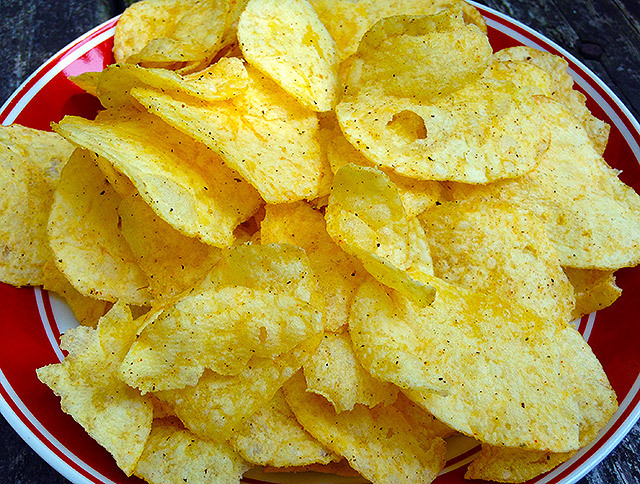 They are, in effect, uber chips, and should they win the vote to become the next perennial, I move for a name change to Lay’s Uber Tubers. 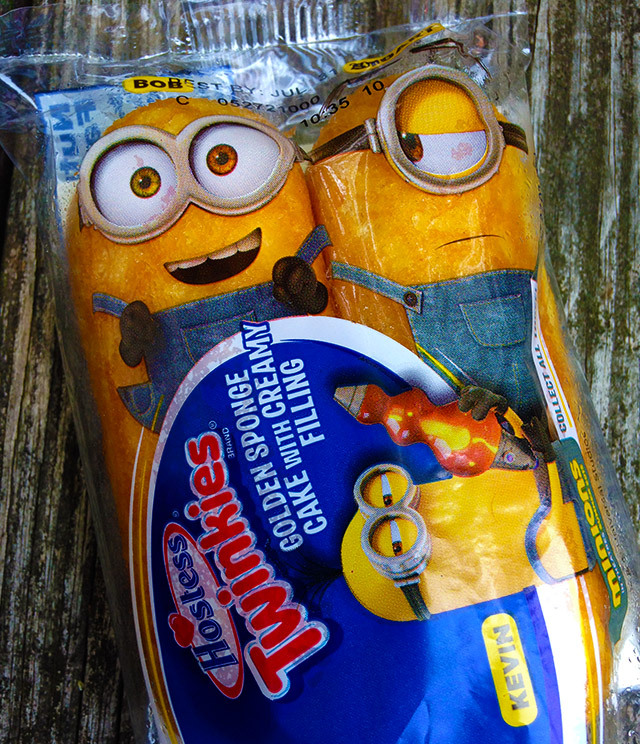 I mainly included this so I’d have a place to mention that I’ve never, N-E-V-E-R seen a movie with as much “food marketing” behind it as Minions. My God! I’m not kidding. This includes both The Phantom Menace and Shrek 2. On a cautious estimate, I’d say that — at least as of a week ago — you’d spot Minions no less than 25 times at any supermarket. If you’re a kid who likes Minions, there’s no way you’re not gonna gain 10 pounds before school starts. Before I leave, this final note: When you take pictures of exposed sugar out in the hundred degree weather, ants try to jump your bones. PS: My latest Star Wars piece is now live! Go read about The Spirit of Obi-Wan, a toothpaste-colored action figure that could only be procured by eating lots of potato chips.